Moving towards an online presence for your business entity….how about using a customized URL through your Google Plus page? Finally, a URL with your business name will be displayed on the screen when searched for!! Earlier, Google had permitted this feature referred to as Google Plus Vanity URL to big brands and celebrities but by offering this across to all Google Plus members, it has definitely widened its horizon to reach out to millions of Google plus users. Currently, it is advisable to proceed for the Custom URL option as quickly as possible especially when you consider this as an extremely cohesive option to integrate your business email, search campaigns, documents and more under a single URL or identity. Big and small business owners should grab upon this opportunity to customize their URL for Google Plus and enhance their online presence. 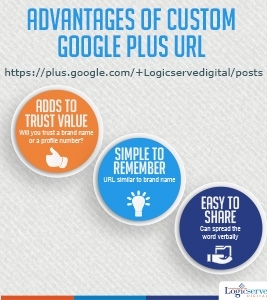 Google plus offers a custom URL after reviewing your business and the website which does mean a great deal especially if you are interested in pursuing your business online. What is Google+ Direct Connect? Google+ Direct Connect (GDC) lets users navigate to your Google+ Page when using Google Search. When searching for a brand or celebrity, you can put a ‘+’ in front of the search term. When a user use the ‘+’ operator before search query, it tells Google to find the Google+ page. For example, when you search for ‘+Logicserve’ on Google, you will be sent to Logiserve’s Google+ Pages, and given the option to add the ‘Page’ to your circles. To make the page eligible for GDC, one must provide a link between Google+ Page and website. This could be done by connecting the Google+ Page and the website using the Google+ badge. Google+ is here to stay and will continue to provide value to the business owners. With capabilities such as video hangouts, free voice calls and other tools; users will continue to flock to the platform. Having said, Google Plus for business is way great way to make a leaping stride.